Our income generating programs aim to provide an alternative for women working in the Guatemala City garbage dump by offering safe conditions and a sustainable income. Creamos believes fostering local leadership is a top priority and continues to provide the organizational structure to ensure our women are the leaders, advocates and voice behind every initiative. There are currently 11 women working on a weekly basis under the guidance of our sewing teacher, who possesses extensive sewing teaching experience. Our participants have fully acquired the skills to sew complex accessories, clothing and have completed larger scale orders for local and international clients. Due to the relentless work ethic of our participants, some have been able to rely entirely on the sewing program as their main source of income. Our women are paid a justified hourly wage for their work and payment is based on one's ability. In 2018, Creamos began screen printing and sewing knitwear, diversifying our products and enhancing the skill set of our participants. In 2018 Creamos will be producing a number of uniforms for the children of Safe Passage. In addition, we offer a monthly community sewing class to women not in the program to learn how to sew which will eventually be taught by members of our sewing program. Furthermore, Creamos is dedicated to utilizing ethically sourced and recycled fabrics ensuring our women are aware of the environmental and social impact of their work. Our sewing program is an initiative that has challenged the individualistic mentality of many people in the community. It has fostered an environment where women have to work together and trust each other. 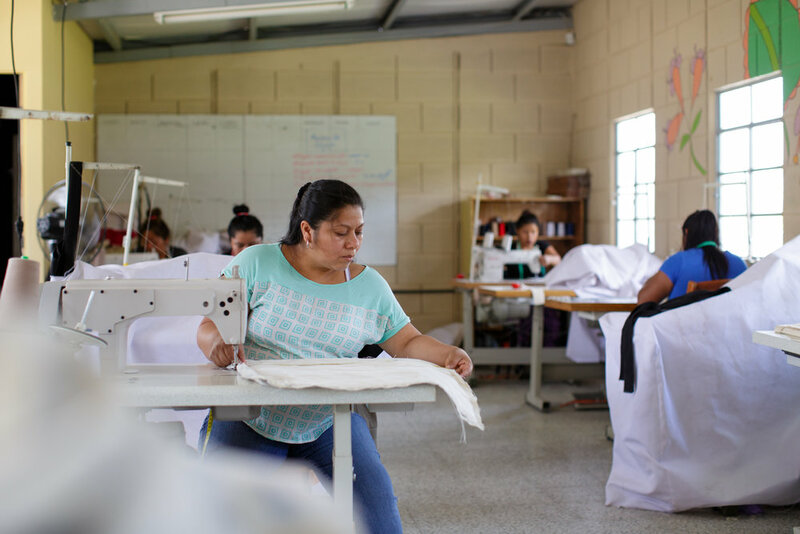 Our seamstresses participate in weekly team building and professional development activities to cultivate a workplace that prioritizes safety and solidarity. The Creamos jewelry initiative consists of 23 women who make necklaces, bracelets, earrings, keychains and other accessories from recycled paper that they craft into beads. The women cut posters, magazine pages and other disused pieces of paper into long strips, roll them and varnish them to make beads of all different shapes and sizes. They then use those beads to make their jewelry; each piece being a reflection of their style and taste. Women in this program are required to study up until middle school to ensure they are fully capable of calculating their prices, and facilitating sales. In addition, women work from home and are only required to come into the project one time a week. This flexibility allows our participants to spend more time with their children, focus on their studies, and foster a positive family environment in their home. Our jewelry is sold in our in-house store, located in the heart of our target community. In addition, we sell our products at local and international events, tradeshows, high end hotels and through individual clients. If you or your company is interested in partnering with Creamos’ production services click the button below for more information!